Trex 450 Plus DFC - A Great CP Flybarless 450 Size Helicopter For Beginners! Trex 450 Plus DFC - A Great Flybarless 450 Size Helicopter For Beginners! 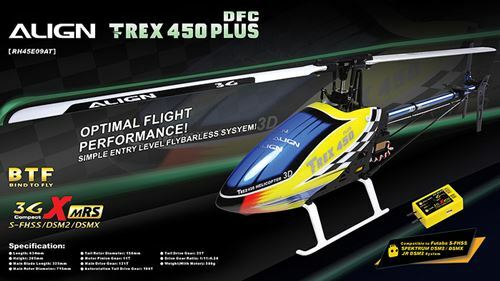 The ready to fly (RTF) and bind to fly (BTF) Trex 450 Plus DFC was one of the best ready to fly Flybarless Collective Pitch RC helicopters on the market at the time, and only after setting a students up and flying it, did I really understand just how good. Update: The 450 Plus has been replaced by the T-Rex 450LP ARTF (links to my full write-up page on it). 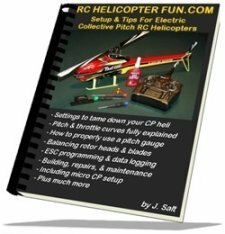 For the past couple years I have been praising the ready to fly Blade 450 as one of the best collective pitch helicopters to start out on and I know hundreds of people now who all successfully learned to fly collective pitch on the Blade 400 & 450. Even after getting higher end and larger machines, many still keep their trusty Blade 400 or 450. In short, they work! The design is good, parts support/after sales support is good, pricing is good and Blade, unlike so many of the other entry level contenders focuses on what works over blinging out a substandard product to sucker in the uninformed. Lastly the Blade 400/450 comes with a decent name brand computerized radio - the Spektrum DX6i. Don't think Align was missing these points and now with their Trex 450 Plus DFC, they are giving us a better bird with better components and have aggressively priced it right in line with the flybarless Blade 450X. Before taking a close-up look of the Trex 450 Plus DFC, let's look at the what this birdie has the potential to do for our hobby in general. First off, there is now another very good option for a good quality and decent priced 450 helicopter for the beginner to start on. Yes, even in this day of micro collective pitch helicopters like the Blade Nano CPs; I, as well as many others still feel the 450's are the best to learn on in most cases (assuming you take your time and have the room). The first two sentences on Align's 450 Plus information page state this point very well: "The T-Rex 450 has been the ideal choice for entry level RC helicopters. To cater to the beginner enthusiasts, Align introduces the RTF (ready to fly) TREX 450 Plus." Secondly, the Trex 450 Plus DFC is a great first flybarless helicopter thanks in part to the very simplified Align 3GX MR stabilization system (more on this in a bit since it's the main reason I'm eating crow right now regarding flybarless and beginner friendly machines). Moreover, the 450 Plus DFC (as the name suggests) uses a DFC head design, giving a very clean & uncomplicated rotor head mechanism with reduced parts count. Again, DFC (direct flight control) and Beginner helicopters are generally two terms that are not mentioned in the same sentence, but by making the mast slightly longer and giving a little extra head dampening by using plastic blade grips, some of the less than friendly beginner DFC tendencies have been reduced. Okay, now that I've said my little piece, let's look at the Trex 450 Plus DFC up close and find out why it's so good! I don't think I have to point out the obvious and that's the Trex 450 Plus DFC is an Align product. If you're not familiar with the Align name, here is a little write up I have done. To sum up, it's one of the biggest names in the RC helicopter industry and they manufacture some of the best quality, highest performance birds on the market while keeping costs reasonable. Good bang for the buck in other words. Align, like Blade also has wonderful parts support in most parts of the world so once again, you will not be grounded for weeks or months waiting for a part. Next up is the radio because as you have likely heard or read me rant on and on about, once into collective pitch, the radio is more important than the helicopter. The top brand manufacturers recognize this too, otherwise they wouldn't put any care into selecting a decent computerized radio system. One that won't trap you into some obscure lower quality 2.4 GHz system but instead a high end name band radio system that you will be comfortable with for years as you grow and progress in the hobby. A computerized radio that will allow you to setup up your machine correctly and progress on it from tame beginner settings to normal or scale, or all out sport, or 3D! Whatever your cup of tea, a good name band computerized radio is the tool you need to brew it. Align in this case has teamed up with Futaba and are including the performance entry level Futaba 6J computerized radio with the Trex 450 Plus DFC RTF. Align has re-badged it with their own name plate and call it the T6, but it's pure Futaba and sports all the same features such as Futaba's F-FHSS spread spectrum frequency hopping protocol and a 15 model memory (5 more than the Spektrum DX6i). Unfortunately, after using the Futaba 6J, I didn't find it nearly as easy to menu navigate or as intuitive as the DX6i and having no graphical display of pitch or throttle curves to me is a very important heli specific feature that is missing. Let's face it, the DX6i changed the computerized RC radio world in the entry level segment, and it's going to take something pretty special in this price segment to do it better. 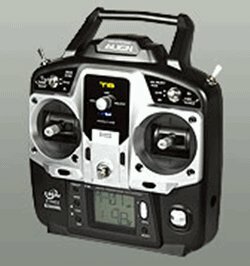 That said, the 6J (or Align T6 if we are being correct), is a Futaba radio that holds it's own. For those who would rather get into Futaba when starting out over Spektrum/JR, this is a wonderful RC helicopter/radio combination to do it with - no question there! The original flybared Trex 450 Plus and now the flybarless DFC version was/are Align's first ever ready to fly collective pitch helicopters. Up to this point, all Align's birds (other than the little micro 100's) came in kit form only and you had to build them. I maintain building a heli from kit form is one of the most enjoyable aspects of the hobby and does have advantages, but for a beginner new to the hobby, there is certainly value in a RTF bird that comes all assembled. The fact this 450 is built up properly by Align's technicians is reassurance for a beginner; they even took the time to coil the tail servo wire, a nice little touch that you usually only see an experienced builder take the time to do. Eventually however, you will have to roll up your sleeves and take things apart to perform maintenance or replace a damaged part/s - that's all part of the hobby and the fun! It's really hard to look past just how pretty this bird is. I have said it time and time again, but high visibility colors on RC helicopters (especially smaller ones) are so important so you can see the little buggers up there in the sky, and Align has done yet another wonderful vibrant and loud color scheme on the Trex 450 Plus DFC - well done! Under that pretty canopy you will find a performance stacked carbon fiber frame set - not plastic with a conventional 120 degree eCCPM servo layout. The 3 digital/metal gear cyclic servos (Align DS415M) are rated at 0.08sec/60 degrees and are orientated within the frame structure to allow near zero slop, direct linkage to the swashplate using a typical 120 degree eCCPM configuration that we are all used to on Align's birds. The Trex 450 Plus DFC is powered by Align's powerful 450MX brushless motor (same one used in their higher performance 450 Pro DFC) in combination with the Align RCE-BL35P 35 Amp ESC getting it's power from the included 2200 mAH, 3S, 30C Align LiPo battery. Included in the package is also an auto LiPo charger very similar to one Blade offers, but unlike Eflite's, this one plugs directly into a standard house wall outlet so there is no need to get a separate AC adapter. The other neat feature is Align is using a helical main/pinion gear combination in this bird. The first RC heli I ever had with a helical gear arrangement was the Trex 600E Pro and I still can't get over how quiet and smooth they run. There is also more tooth contact area so they last longer and are less likely to strip out. The tail rotor is belt driven to keep costs & weight down, and for a beginner, a belt driven tail is more drive gear strip out forgiving should an accidental tail strike occur. Paired up to the tail rotor is Align's digital DS425M metal gear tail servo. With a speed rating of 0.05 sec/60 degrees at 6.0V, this is a fast little tail specific rascal that gives an outstanding tail lock. The little DS425M & DS415M servos get their commands directly from Align's 3GX MR Flybarless stabilization unit. As I mentioned earlier on, The 3GX MR is the main reason this flybarless helicopter can be considered beginner friendly. It's not at all like Align's 3G and higher performance 3GX system that both need a fair amount of understanding and time to setup & configure correctly. The MR version performs all eCCPM servo mixing internally meaning there is no complicated 120 degree swash setup mixing to configure. Just select a normal 90 degree swash type in the radio (Futaba lists this as an H-1 swash type), ensure the servos are plugged into the correct output, and the 3GX MR does the rest. There are essentially only 3 swash specific items you have register on the MR and that is the center neutral positions of your 3 swash servos. This is done by using the rudder stick to get your servo arms at right angles to the main mast. Super fast & super easy! The other 3 values you need to register are for the tail gyro portion of the setup which includes tail servo center point and left/right travel limits. Tail gain is set remotely from the radio and cyclic gyro gain is set using the two potentiometers on the 3GX MR unit, similar to the way they are on the Align 3G and 3GX flybarless units; however, gain for both axis (roll & pitch) are combined in one pot and the other one adjusts how fast the the two gyros will allow the heli to roll or pitch off axis. My student (who had no previous flybarless experience) actually explained to me how to go through the setting steps when I was ensuring the swash was level and the collective range was on the mark which says alot about how beginner friendly this system is. In fact, I find it even easier than the BeastX (which is another easy system to figure out), but I admit I have more experience with Align's flybarless units so I'm sure that familiarity played a role. This simplified setup does come at a fairly high cost however; namely a lack of adaptability and configuration options and no way to update firmware. The 3GX MR's simplified setup is only possible because many parameters of flybarless adjustment have been eliminated. For instance, the unit HAS to be mounted in the helicopter upside down facing forward - there are no other placement options because that is the way the internal gyro and direction settings are configured. The unit will also only function in the Trex 250 & 450 (there is a setup selection for either heli). This is the real limitation with the 3GX MR system, and you have no control over all the variables that you can set on the full function 3GX unit. 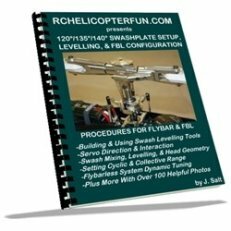 Again, this heli is for the beginner who is brand new into flybarless and by eliminating all those many options and fields to configure, has made simple flybarless system setup a very possible reality (as my student demonstrated to me when he fully explained how the system worked). The other major difference with the Align 3GX MR unit over the 3GX is it has a built in receiver using Futaba's S-FHSS spread spectrum protocol (that's what the MR stands for - micro receiver). In short, the 3GX MR will only work with Futaba FHSS 2.4 GHz radios, much the same way the Spektrum AR-7200BX flybarless unit will only function with Spektrum's DSM2/X 2.4 GHz protocol. This is a nice way to save space, weight, and reduce costs on a smaller heli because a separate receiver is not required (a trend that I predict will become the norm with many flybarless units over next several years). With my student's Trex 450 Plus DFC all setup with tamed downed settings and sporting a set of training gear, I really could not get over how nice and stable it was without any aggressive flybarless/DFC cyclic tendencies that I thought would be apparent. By the way, no funny flybarless/training gear compatibility issues either. Again, I'm pretty partial to flybars for first learning collective pitch on, but this thing was solid as a rock and with the very simple setup steps and surprisingly gentle nature; I now have very good reason to change my mind. With a more aggressive setup dialed in, the Trex 450 Plus DFC was a very nice and predicable aerobatic performer. It tracked on rails just like any good flybarless machine should and was very smooth and predicable with lots of power. BIND TO FLY TREX 450+ VERSION? The only thing the Blade does have going for it over the Trex 450 Plus DFC is the AR-7200BX flybarless unit. However, the AR7200BX is not training gear friendly and I know first hand the 3GX MR/S is. Again, the Trex 450 Plus is for the beginner CP pilot and training gear usage is an important consideration. The BTF Trex 450 Plus DFC basically comes with all the same stuff as the RTF version less T6 radio, LiPo battery, and LiPo battery charger (same as what Blade is doing with the BNF 450X). Personally, if I was just starting out in the hobby, wanting to fly with a Futaba radio and wanted a prebuilt 450 size bird, I would likely be picking up the 450 Plus DFC BTF and pairing it to the Futaba 8J. The 8J is a great radio for the price and has all the important heli features (and more) that the 6J/T6 are lacking. If and when you progress into bigger, more costly & complex machines, you won't be second guessing the 8J's ability as you might with the entry level 6J/T6. The 3GX MRS FBL unit that comes with the BNF version is both is both Futaba FHSS compatible as well as Spektrum/JR DSM2/X (with the addition of a Spektrum/JR DSM2/X satellite receiver). Without a doubt, the new 3GX MSR will start being used in the 450 PLUS DFC RTF version as well once older MR stock is used up so all you Spektrum or JR DSM2/X fliers, keep an eye open for that! This new 3GX MRS unit is also good up to 500 size now, so my guess is Align is not only going to have the ready built 450 Plus DFC BTF, but a 250 Plus DFC BTF, and a 500 Plus DFC BTF. All this is pretty exciting if you are a beginner new to collective pitch and don't necessarily want a 450 size machine, plus have the option to fly with Futaba FHSS or Spektrum/JR DSM2/X. The Trex 450 Plus DFC is not up to the Trex 450Pro DFC or high powered 450L Dominator in terms of high end performance features, but that's not what we are comparing it to. This is Align's direct competition to the Blade 450X which has basically owned the skies for the past 2 years in the RTF 450 segment and prior to that the Blade 450 3D & 400 owned it for 5 years. There is not one component on this bird that doesn't outshine the Blade 450X's in terms of overall performance and quality other than the radio and the flybarless system. The T6 radio is one item that might put a few people off, but there are many that would rather get into a Futaba system over a Spektrum. If you don't like the entry level T6/6J radio, there is always the 450 Plus DFC BTF version to pair to the higher end Futaba 8J or 10J radio or Spektrum/JR DSM2/X radio. The easy to setup 3GX MR/S units certainly have their limitations, but as a beginner flybarless system (which is exactly what it is), it works very well and is not in the least bit intimidating to figure out. For the past seven years I have been wholeheartedly recommending the Blade 400 and 450 to beginners for all the reasons I stated in the reviews I did on them. However, the Align 450 + DFC offers very stiff competition. 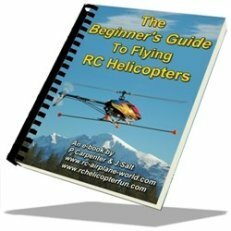 It's actually my new favorite in the pre-built/ready to fly or ready to bind 450 segment for beginners who want flybarless to start on and don't want to build their first CP heli from kit form. Please note: There are still older BTF versions of the Trex 450 Plus DFC out there that came with the Futaba S-FHSS compatible 3GX MR unit and don't have the newer 3GX MRS that is both Futaba S-FHSS & Spektrum/JR DSM2/X compatible. If you intended to fly with a Spektrum/JR DSM2/X radio, make sure the BTF box shows that it comes with the new yellow 3GX MRS FBL unit. As a reminder, you also need to use a Spektrum DSM2/X satellite/remote receiver to plug into the 3GX MRS to fly it with a DSM2/X Spektrum or JR radio. Not sure how to tame down your Trex 450 PLUS DFC for learning on? My Setup & Tips for Collective Pitch RC Helicopters eBook covers all that and much more. Click on the image or link if you want to learn more about it.